Are you looking for an affordable skateboard that can be used for daily commuting? Well, you have come to the right place. From the leading Chinese producers of electric drones, comes a brilliant and affordable product that has the potential to revolutionize its market. The brand-new Yuneec E-GO2 Longboard relies on its impressive portability, along with its affordable price point to dazzle skateboard riders. Is Yuneec E-GO2 Longboard Safe? Is Yuneec E-GO2 Longboard worth it? Max Range on full charge 18 miles. Wheels 90 mm x 52 mm. Available Colors Cool Mint, Hot Pink and Royal Wave. The Yuneec E-GO2 Longboard has a strong and quality build design that is set to rival some of the $1000 skateboards out in the international market. It features a 12-mm thick composite wood board that can carry a max weight up to 220 lbs. Its longboard is made up of eight different composite wood layers which make it quite flexible and durable in the long run. 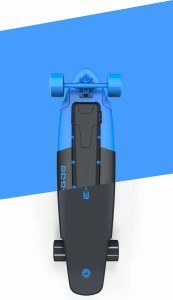 The overall deck size of Yuneec E-GO2 Longboard is 35.8 inches, and its kick tail shaped design enables the rider to have better controls with their remote while riding this skateboard. This model is quite light compared to most other skateboards, so it is easy to carry around. The Yuneec E-GO2 Longboard comes equipped with a 400-watt power motor which makes this skateboard speed up quite smoothly while riding it. As far as the performance aspect of this longboard is concerned, there are 2 different riding modes that can be utilized for variable speed control. They are the Eco mode and the Sport mode. The top speed on this skateboard is 13 MPH, which is quite good for commuting at a relatively safer pace. Its electric battery is quite powerful and can charge the whole skateboard via a USB charging outlet located at the bottom of the skateboard. Average time required for a fully charged skateboard is around 4 hours, which is within the estimated 3 to 5-hour range. On a single charge, this Yuneec E-GO2 Longboard can ride up to a maximum of 18 miles or 30 kilometers. This Yuneec E-GO2 Longboard comes with a special wireless remote control that enables you to maneuver your skateboard smoothly on the fly. You can easily accelerate or apply brakes on your skateboard with a slide of the remote’s knob. It pairs with your skateboard’s Bluetooth receptor, and its wireless functionality is pretty spot on. There is also an iOS and Android app for your Yuneec E-GO2 Longboard that contains every detail that you will need about your skateboard. It displays the charge remaining on your skateboard with the use of LED lights. In addition to that it also includes controls for maneuvering your longboard on the road. Regenerative braking helps the user to slide into a stop, rather than stop abruptly, making it difficult to control the skateboard while riding. The board is extremely well-built, with a sturdy composite layered design. It can carry up to 220 pounds. On increasing the weight beyond that limit, only the top speed of the board is affected and not its reliability. The 10% uphill max gradient ratio for this skateboard is quite decent, as it enables riders to take their skateboard uphill without any issues. All products and accessories for Yuneec E-GO2 Longboard are guaranteed with a manufacturers’ warranty for a period of 6 months. The top speed might seem a little sluggish at times but 13 MPH for a skateboard is a perfect speed to commute in a city. The Yuneec E-GO2 Longboard doesn’t cost much, as far as commuting skateboards are concerned. So, in conclusion to this, the only question that remains: is this longboard worth its price? Well, it absolutely is. You would not get such a diverse and well-equipped skateboard in this price range anywhere else. Click here to know the price. Yuneec has certainly increased the competition when it comes to budget skateboards, and their E-GO2 Longboard is a prime example of that.